How cute are the new word thinlits? 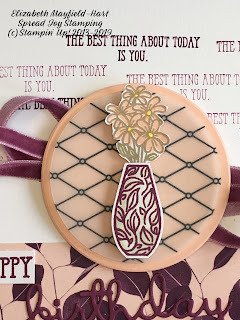 I absolutely LOVE how beautifully these new vases stamp! 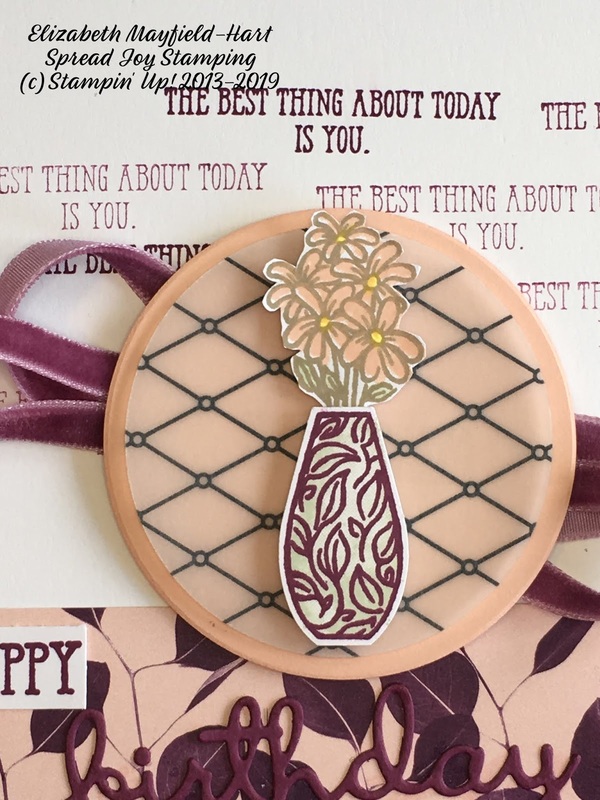 The fill-in stamps are our new photopolymer DistINKtive stamps and they make the most beautiful color in the vase stamp that I've ever seen! As you can see in this close up below, I stamped the color inside the vase in Soft Sea Foam, and it's darker around the edge of the vase with a very light spot near the top center of the vase. It's just beautiful! Did you notice that the vellum under the vase is the Graceful Glass vellum from the Annual Catalog? Doesn't it give the circle an elegant feel? I think that without it, the flowers would probably disappear into the circle of Petal Pink. the poofs of ribbon give me. This amazing stamp set is called Vibrant Vases (148656, $17.00) and it matches the Vase Builder punch from the Annual Catalog! (147040, $18.00). I used the Well Written Framelits (148534, $40.00) to cut out the word "birthday". 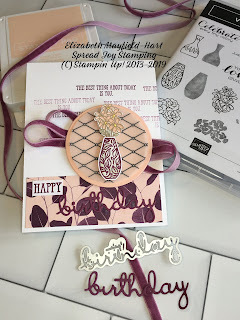 I stamped this card in Blackberry Bliss and Petal Pink with a couple of touches of Soft Sea Foam. 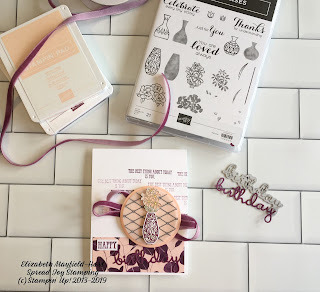 I paired it with the Nature's Poem Designer Series Paper (146338, $11.00), and the Rich Razzleberry Velvet Ribbon (147016, $8.00). It's Sale-a-bration time at Stampin' Up! and we have an amazing special when you purchase the starter kit. Now through the end of March you get an extra $50 worth of product in your starter kit for FREE! 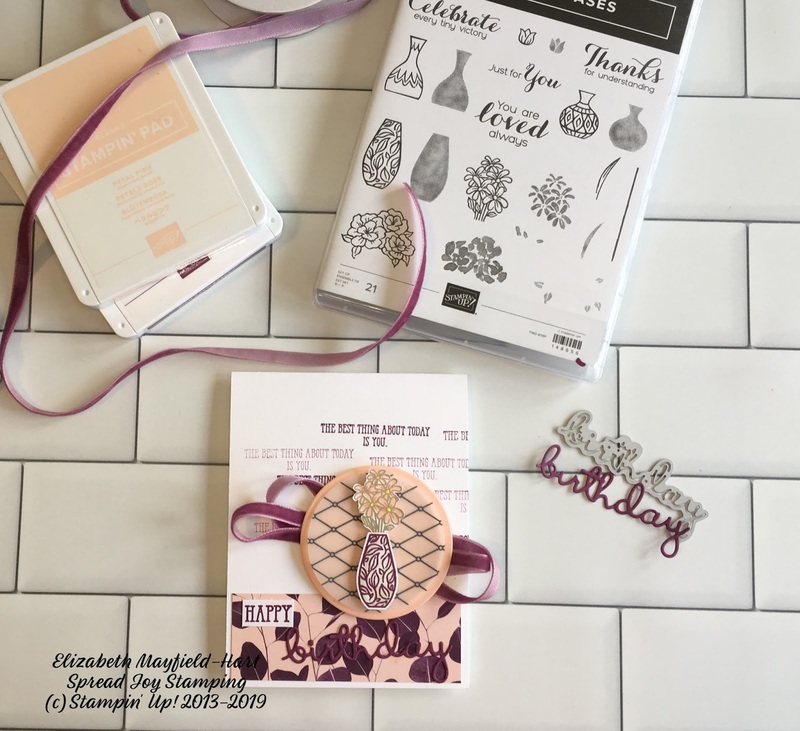 Making this card would be a SNAP with the Starter Kit!